Give pan-roasted chicken Asian-style appeal with toasted sesame dressing & lite soy sauce. 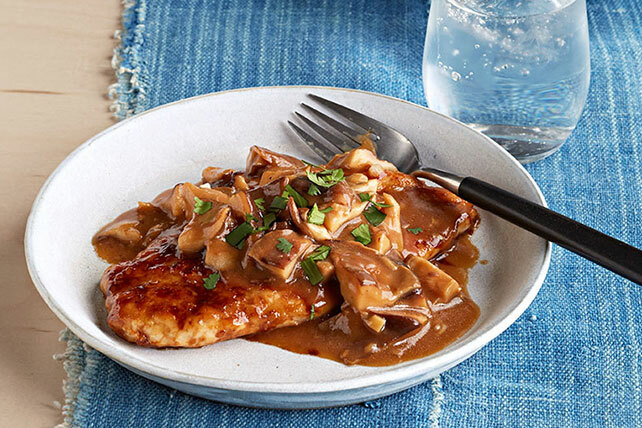 Pan-Roasted Chicken with Shiitake Mushrooms is a weeknight win. Place 2 Tbsp. flour in pie plate. Add chicken, 1 piece at a time; turn to evenly coat both sides of each breast with flour. Heat 2 Tbsp. dressing in large nonstick skillet on medium-high heat. Add chicken; turn to evenly coat both sides of breasts with dressing. Cook 3 to 4 min. on each side or until evenly browned on both sides. (Chicken will not be done.) Transfer chicken to plate; cover to keep warm. Add 2 Tbsp. of the remaining dressing and mushrooms to skillet; cook 8 min. or until mushrooms are golden brown, stirring occasionally and adding garlic to the skillet for the last minute. Stir in remaining flour; cook and stir 1 min. Add broth, soy sauce and remaining dressing; cook and stir 2 min. or until slightly thickened. Return chicken to skillet; spoon mushroom mixture over chicken. Cook 2 min. or until chicken is done. Serve this Asian-inspired main dish with 2 cups hot cooked jasmine rice. Garnish with chopped fresh cilantro before serving. Pounding the chicken breasts allows them to cook more quickly and evenly. To pound the chicken, place the chicken in a freezer-weight resealable plastic bag. Pound the chicken with the side of a heavy can, rolling pin or meat mallet until desired thickness. The bag will contain the liquids from the chicken, minimizing the mess.